The answer you provided graciously and appreciated here, but, just not get me to where i need to be. perhaps my communication is poor. I need this form with all the grids and boxed as shown, etc,...just like you see here. etc. I know how to change the submit, thank you, etc. If I'm asking too much, I understand, but need to know. Now both forms in your account are empty (I would actually suggest to remove such forms from your account). Can you please tell us if by the layout you mean that you would like to have the lines shown as on the image - around each field or if you have any reference to link to so that we can check it out and understand what you would like the end result to look like? If it is just like the image above, but with dropdowns in Band column, than we could work out some CSS code that would place the dropdowns 'into' the cell. It needs to look like EXCEL with the nice single line cells. I've tried to paste a copy of the EXAMPLE prepared in EXCEL below, i.e., if the image/format HOLDs together when sent to you. The size below is about right. I would like a dropdown for appropriate blank cells under BAND, MODE Cells per previous data submitted. And, if this is all possible, then rather than list the TWO CALL Signs....make a DROP DOWN for cells under CALLSIGN as well for the selection rather than for it to be a static. If the Format doesn't seem to come over to you, perhaps I could copy to WORD and send via email for you to see what I am talking about. Thank you for you patience....hope not to be too much of a pest. Bummer....I can see now after I replied that he Spreadsheet format did not hold together. If you have an email and permitted for me to send, I can do that as an attachment in WORD. I would actually suggest sending us the screenshot instead Randy. That way we would be able to see it just as you do since for example, I am using Google Spreadsheet or LibreOffice Calc and often the things do not look quite the same as Excel file. You can see how to do that by following these steps: How to add screenshots/images to questions in support forum? tried to add. Can't figure it out; guess I will have to give up. Just don't understand, though, all I want is a spread sheet with certain coulumn with a dropbox. I've defined the columns. Oh well , tnx for trying. The reason why I was asking more questions because, while it did not look like the Excel or any other spreadsheet, the Configurable List would allow you to add the dropdowns and keep everything in a similar layout. Would that work for what you are looking to achieve? I need the simple GRid like EXCEL and put a few dropbox's in it. Using Configurable list is easy and we believe that your requirement can be achieved by using this widget. I've tried working out on your requirement using the configurable list. Please see the demo below and let us know if that works for you. Using this widget, you can add a number of rows by default and can also restrict to a maximum number of rows that you need. Please feel free to clone this JotForm to your account by following the instructions provided in the guide below for making any modifications as you need. ah.....my hero!!! Thank you, and yet I can use this. I imported already into my website; no problems. Now, question: The TEXT at the top..."Configurable List", does that have to stay? I think it could confuse the user. Next, I plan to use this form on several pages. 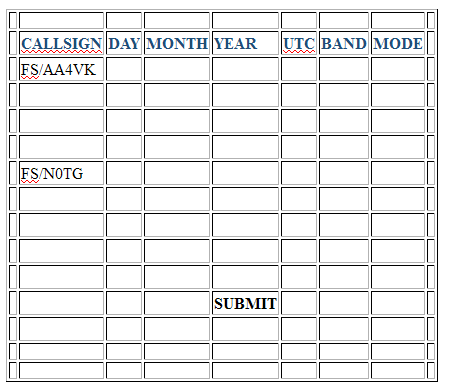 Each page will Need a Different DROP DOWN for the first colum (CallSign). Can I change that myself , behind the scenes? some of the page forms on other pages will need to be sent to different email. Can I change that behind the scenes? Thanks, good job and thanks to the other folks as we moved step by step to get to this. Thank you. We are glad that we could help you. It's our pleasure to assist you. The text "Configurable list" can be changed as per your requirement on your JotForm just by clicking on it. Also, the first column of the widget can be changed from the widget wizard. Please see the recorded session below that can help you with this. Since you need different options in the dropdown for different pages, you may need to create multiple forms by cloning the same form for each page. Your question on email setup is moved to a separate thread mentioned below to avoid confusions discussing multiple issues on a single thread.